Vitamin D is known to interact with over 200 different genes and thus plays a crucial regulatory role as a metabolic activator for a multitude of metabolic processes. 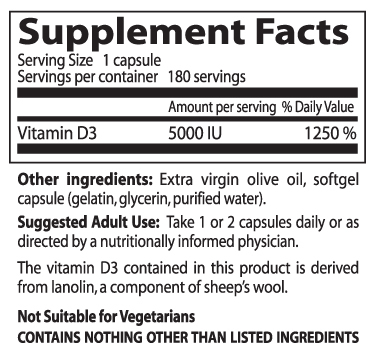 * Common supplemental forms of Vitamin D include D3 (cholecalciferol) and D2 (ergocalciferol). Vitamin D3 is the naturally-occurring form in humans. Research shows that supplemental vitamin D3 (cholecalciferol) is significantly more efficient at converting to active vitamin D in the body than vitamin D2 (ergocalciferol).1 This makes vitamin D3 the preferred supplemental form of this nutrient. Vitamin D is essential for life. It regulates calcium homeostasis in the human body, which is of vital importance as calcium is involved in the function of all cells. Calcium balance is also essential for bone growth and formation, as well as for the function of the nervous system. Vitamin D has been shown in multiple studies to support healthy bone structure.However,over the last several years,more and more research has focused on other critical functions of this hormone-like vitamin. Vitamin D plays a role in most organs and systems of the body. Like other hormones, vitamin D acts as a molecular switch by influencing the expression of multiple genes.1 Thus, activated vitamin D not only influences bone health, but is involved in supporting the function of the immune system, cardiovascular system, respiratory system and the musculoskeletal system, among others. Added to the knowledge of how vitamin D can affect the function of various organs throughout the human body is research showing that a majority of individuals are not getting optimal levels of this crucial supervitamin on a daily basis, placing them at risk for deficiencies. While we obtain some vitamin D from our diet, the major source for replenishment of vitamin D levels is exposure of the skin to sunlight. Adequate daily sun exposure is considered to be sufficient to fulfill the human requirement for vitamin D. However, a number of factors affect our ability to refresh our vitamin D supplies. First, due to the climate we live in, sun exposure is not always possible year-round. This is the case especially in northern latitudes and much of the northern United States. Second, direct sunlight exposure on the skin is needed for vitamin D production to occur. Covering skin with sunscreens and other topical products prevents the necessary exposure from occurring. Skin color is also a factor when it comes to adequate vitamin D production. Individuals with darker skin require longer sun exposure than individuals with lighter skin to produce the same amount of vitamin D. Furthermore, UV rays from the sun do not penetrate indoors through windows. Since UV light is required for vitamin D synthesis in skin, being indoors leads to no production of vitamin D. For one or more of these reasons, we often fail to meet our vitamin D requirements for health. Vitamin D toxicity is extremely rare. In order to reach toxic levels, most adults would have to consume 10,000 IU or more per day for many months or years. Vitamin D3 (cholecalciferol, the form found naturally in animals and humans) toxicity has rarely been reported in the literature. Most reports of vitamin D toxicity have been attributed to faulty production, labeling and dosing errors or to the use of vitamin D2 (ergocalciferol).1 When used in the amounts recommended, vitamin D3 is very safe. Vitamin D from dietary intake or sun exposure requires two activation steps in the body. The first activation occurs in the liver, while the second activation occurs in the kidneys, allowing for regulation of calcium metabolism. However, vitamin D receptors are present throughout the body, in tissue such as the skin, cartilage, heart, prostate, bones and intestines. Thus, the second activation step also takes place in local tissues. Recent discoveries have highlighted the important modulatory effects of vitamin D on various cells of the immune system. Studies in humans have confirmed the importance of vitamin D for heart function. In a study consisting of 1,739 participants from the Framingham Offspring Study, those individuals with the highest levels of vitamin D had superior cardiac function in relation to those with low vitamin D levels.5 These results make sense when taken in context of the overall effects of low vitamin D. These effects include an imbalance in the immune production of inflammatory markers, disturbing the normal inflammatory response and leading to potential effects on all tissues, including the heart and blood vessels. Restoration of optimal vitamin D status supports a healthy, normal inflammatory response and may thus restore the optimal health of the heart and cardiovascular system. The role of vitamin D for bone health (alongside that of calcium) has been well-characterized in published literature. Vitamin D is obviously required for optimal calcium absorption. Recent studies have shown that possibly a majority of women with bone health issues have low levels of vitamin D. In some studies, this number is well over 60%. One such study found that out of a total of 2,606 postmenopausal women assessed, more than 64% had levels of vitamin D of less than 30 ng/mL (measured as serum levels of 25(OH) D, a common blood measure of vitamin D sufficiency). These authors state that, according to a recent review article, the optimal vitamin D levels as measured by 25(OH) D are between 50 and 80 ng/mL.8 Thus, levels near 30 ng/mL are significantly below those considered optimal. An interesting study was performed recently in Finland in which 212 adolescent females were divided into three groups a placebo group receiving no vitamin D, a low-dose vitamin D group (200 IU per day) and a higher dose vitamin D group (400 IU per day). The study aimed to measure the effects of vitamin D intake on bone mineral density in these young healthy females who also had adequate calcium status. At the end of the one year study, both vitamin D groups had significant improvements in bone density measured at the femur bone, whereas the 400 IU group also had significantly higher mineral density at the lumbar spine.9 These findings indicate the importance of vitamin D in bone structure and formation and also indicate the role of vitamin D in bone health independent of calcium intake. Given its role as a promoter of gene expression, vitamin D affects numerous systems throughout the body. Research unmistakably shows that vitamin D is also a regulator of cellular health and wellness. Aged, unhealthy cells tend to lose their ability to differentiate and perform their original intended function due to the cumulative effects of oxidative damage. Vitamin D, acting as a pro-hormone, promotes the ability of cells to maintain their normal life cycle of birth, differentiation, functional performance and death, when they have become overly damaged.10 Damaged cells can lead to damaged tissue function. By promoting the normal cell cycle, vitamin D ensures the progression of cells through their functionality and their healthy renewal. Office of Dietary Supplements. Dietary Supplement Fact Sheet: Vitamin D.
Holick MF, Chen TC, Lu Z, Sauter E. Vitamin D and skin physiology: a D-lightful story. J Bone Miner Res. 2007 Dec;22 Suppl 2:V28-33. Van Etten E, Stoffels K, Gysemans C, Mathieu C, Overbergh L. Regulation of vitamin D homeostasis: implications for the immune system. Nutr Rev. 2008 Oct;66(10 Suppl 2):S125-34. Zittermann A, Koerfer R. Vitamin D in the prevention and treatment of coronary heart disease. Curr Opin Clin Nutr Metab Care. 2008 Nov;11(6):752-7. Zittermann A, Frisch S, Berthold HK, Götting C, Kuhn J, Kleesiek K, Stehle P, Koertke H, Koerfer R. Vitamin D supplementation enhances the beneficial effects of weight loss on cardiovascular disease risk markers. Am J Clin Nutr. 2009 May;89(5):1321-7. Lips P, Hosking D, Lippuner K, Norquist JM, Wehren L, Maalouf G, Ragi-Eis S, Chandler J. The prevalence of vitamin D inadequacy amongst women with osteoporosis: an international epidemiological investigation. J Intern Med. 2006 Sep;260(3):245-54. Viljakainen HT, Natri AM, Kärkkäinen M, Huttunen MM, Palssa A, Jakobsen J, Cashman KD, Mølgaard C, Lamberg-Allardt C. A positive dose-response effect of vitamin D supplementation on site-specific bone mineral augmentation in adolescent girls: a double-blinded randomized placebo-controlled 1-year intervention. J Bone Miner Res. 2006 Jun;21(6):836-44. Holick MF. Vitamin D: importance in the prevention of cancers, type 1 diabetes, heart disease, and osteoporosis. Am J Clin Nutr. 2004;79(3):362-371.